Do you like the 4-leaf clover bookmark I made long ago? I "put" it on a solid granny square lately. 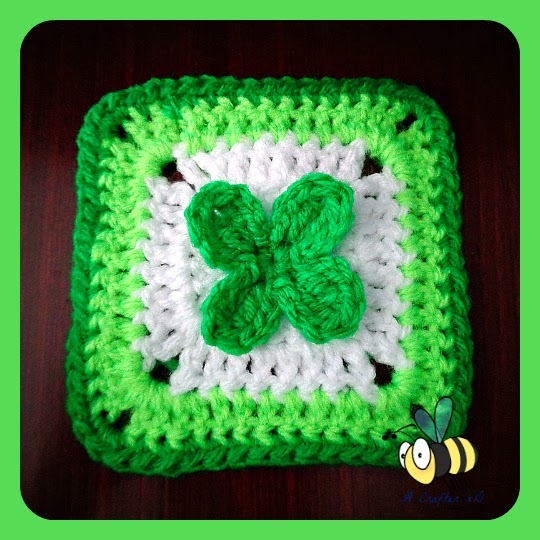 This granny square pattern has a pop up shamrock in the middle but the square bed is crocheted continually from a shamrock. Now work all sts with front-loop only. *Ch 3, crochet 2 tc into next st, ch 3, sl into next st* ( finished 1 little leaf ), repeat ** 4 times to get a 4-leaf clover. Flip it, you'll see the back-loop at the back. With white yarn, insert hook into the back loop of last st. Ch 3 (or standing dc), dc into same st, crochet 2 dc into every st, sl into 1st st to join, total 24 sts. Ch 4 (or standing tc), dc into same st, 4 dc across, 1dc and 1 tc into next st, ch 2, *1 tc and 1 dc into next st, 4 dc across, 1dc and 1 tc into next st, ch 2* repeat ** 3 times, sl into last st to join. Now every ch 2 at the corners is a loop. Change to light green yarn, ch 3 (or standing dc), 7 dc across, 2 dc into loop, ch 2, 2 dc into loop, *8 dc across, 2 dc into loop, ch 2, dc into loop* repeat 3 times, sl into 1st st to join.